Stefan Banach was my father Wilhelm Greczek's half-brother, older than him by 5 years. As an adolescent after World War II and living with my parents in Great Britain I remember my father often speaking about my uncle Stefan whom he recalled with obvious pride and affection. He also related the facts, as he knew them from his father (my grandfather) Stefan Greczek, concerning Stefan Banach's early childhood, his mother Katarzyna and the circumstances that at the time made it impossible for her and grandfather to be married. As recounted by my father, Grandfather Stefan instead took the most honorable action possible in agreeing with Banach's mother that they should separate, so that she might return to her village and not be exposed, and for him to take sole charge of and responsibility for the child. In this respect, as with all the other details already provided by my cousin Professor Monika Hajnos-Waksmundzka concerning the subsequent relationship between Banach and his father, I am able to confirm close agreement with what I remember hearing from my father. After the war my father was not able to return to Poland and together with my mother they spent the remainder of their lives in Great Britain. During that time they had infrequent contact with my cousin Monika's family and very limited opportunity to share information relating to Stefan Banach, who was by that time deceased. My reaction, therefore, on first reading Monika's independent account was a pleasant surprise on how closely it corresponded to what I knew from my father. I am now excited that hopefully the record of these early days can at last be set straight to show our grandfather in a deservedly much better light as compared to and in contrast with what has appeared in several articles about Banach. These castigate him as someone without feeling and uncaring for the child and his mother and as having abandoned them both. On the contrary, the opposite is true. For example, it was I believe very characteristic of him that, following the seizure in 1939 of my parents' house by the Nazi authorities, and after my father had been forced to flee the country, grandfather immediately took my mother and me to live with him, despite his rather small apartment in Kraków (at 4 Bonerowska Street), and we were welcomed to remain there throughout the war years. And, even as a young boy at that time, I remember him as a devout Christian and caring and principled person that my mother and I always looked up to with love and respect. A few years after Stefan Banach's birth grandfather married my grandmother Helena (nee Alfus). Together they had only one child, my father Wilhelm Stefan, born in Kraków on January 15, 1897. Within a few years after that they separated and grandmother went to live in Vienna taking my father with her. Sometime later grandfather obtained legal custody of my father who then returned to Kraków to be with him. It was during these years that Banach and my father spent a lot of time together and related as brothers. Anecdotes that my father used to tell of that time included that Banach tutored and helped him with mathematics, that they both liked to play football and that they looked so much alike that sometimes family friends and acquaintances had difficulty telling them apart. I understand that during the years before the war Banach would visit us from time to time in Kraków but as a young child (aged 3-I was born in August, 1936, in Kraków) I have no recollection of those visits. During the war, and with my father having already left Poland, I understand my mother and I had only limited contact with Banach and I myself do not remember seeing him during that time. I do recall, however, my mother very upset telling me she had been notified of his death-in 1945. The following is some additional information, not directly related to and not apropos of Banach, however, I would nevertheless like to provide it. With Banach's increasing world-wide fame more details will perhaps be searched out and more distant family connections documented, and those facts too should be accurately rendered. 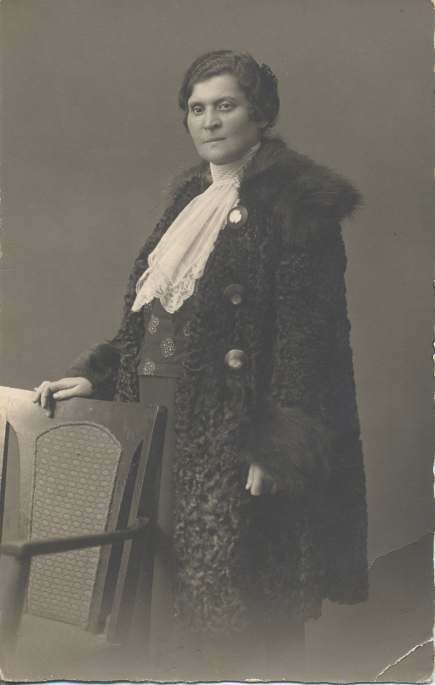 Helena Greczek, first wife of Stefan Greczek and grandmother of Janusz Greczek, Wrocław 1922. 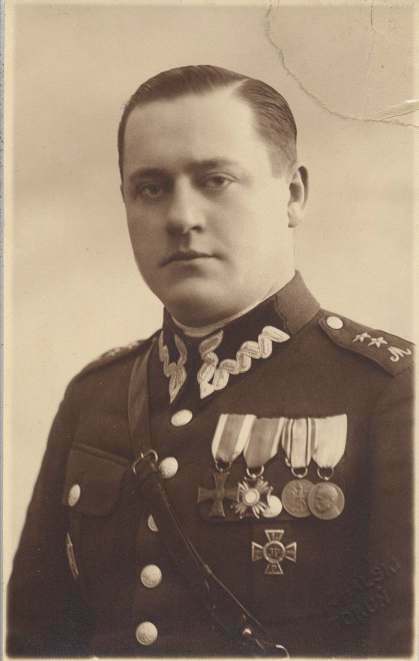 Wilhelm Stefan Greczek (1897-1971) at the age of 24 in the Polish officer's uniform just after the Polish-Soviet War (February 1919 - March 1921). He was son of Stefan Greczek, half-brother of Stefan Banach and father of Janusz Greczek. 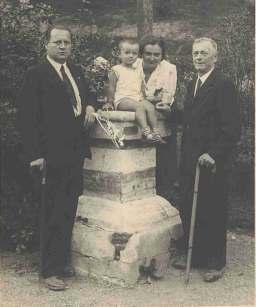 Greczek's family in Kraków in 1938. 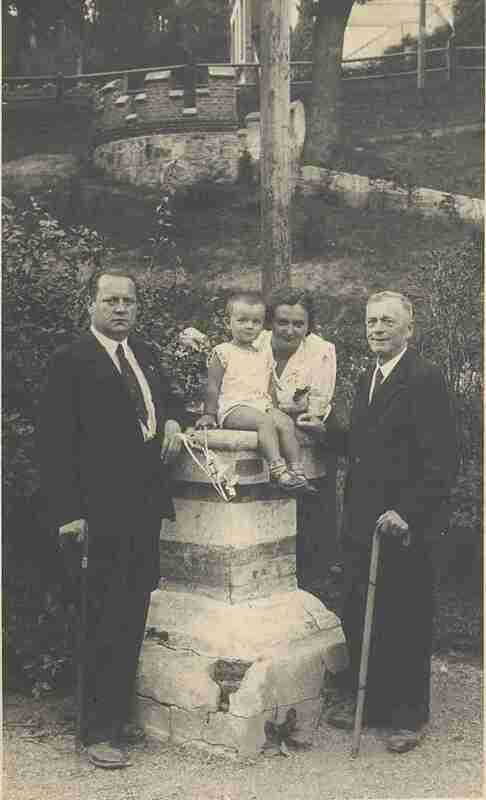 From left to right: Wilhelm, Janusz, Justyna and Stefan - father of Stefan Banach. 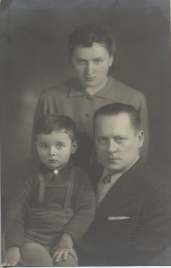 Janusz, Justyna and Wilhelm Greczek in 1939. Grandfather Stefan was very close to us throughout all the years we were in Poland and corresponded with us regularly in Britain after the war. He died a few months short of reaching 100 years of age while still in the same apartment in Kraków. Grandmother Helena visited and was in frequent contact with my parents before the war and then corresponded with us often when we were in Britain. She remarried and lived with her second husband in Czechoslovakia until her death there in the mid-1950s. While my parents missed her and often spoke about her in warm terms, as an older boy I do not recall that either one of them ever spoke to me about her marriage to my grandfather. It was, I always thought, something they perhaps did not know very much about. My father Wilhelm Stefan attended the Jagiellonian University in Kraków to study law and served in the Polish Army with the rank of Captain in the Polish-Bolshevik War. He was later a high-ranking director of the Polish Railroads for the Katowice region. In 1939 he had to leave Poland and made his way to France where at Coetquidan he joined the recreated Polish Army commanded by General S. Maczek which was dispatched to protect the Scottish coastline and came under British command. Later during the war my father was on the staff of the Polish Military Staff College near Peebles in Scotland with the rank of Major. My mother and I arrived in Britain shortly after the war. I received most of my schooling there, studied chemical engineering and graduated with a Ph.D. degree from the University of London in 1965. I have been in the USA since 1966 with my wife Muriel (nee Millar) and our two sons Steven (Stefan) and Colin. My father died in 1971, my mother Justyna (nee Nakielna) in 1990. We sincerely thank Dr. Janusz Greczek for his kind permission to post his recollections on this website.